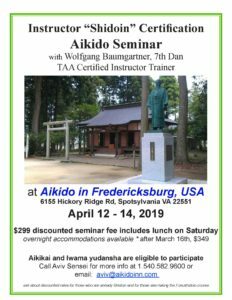 Upon satisfactory completion of this course, students will have acquired the essential advanced knowledge and information to become more effective instructors of Aikido. The intent of the technical content is not to impart additional practice skills but rather to point out details that are helpful in teaching these. Note that in addition to completion of this course, there are training and teaching experience requirements to complete the TAA Shidoin certification. This course focuses on the needs of an instructor who has a regular teaching responsibility in a dojo. It assumes proficiency in all techniques covered; the purpose of the course is to highlight details that are useful during instructing duties. The course consists of 14+ contact hours that include a combination of mat work and lecture/discussion. * Key technical details for each technique. * Common pitfalls and training issues on certain techniques. * Effective presentation of techniques. Lecture/discussion includes interactive discussion on such topics as: teaching approach, dojo administration, and development of Aikido.